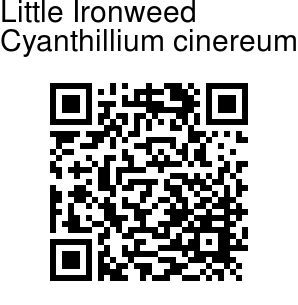 Little ironweed is an annual or short-lived perennial to 50cm with ovate leaves. The stems branch repeatedly at the top to hold aloft the small cylindrical, purple flower heads. Flowers throughout the year. 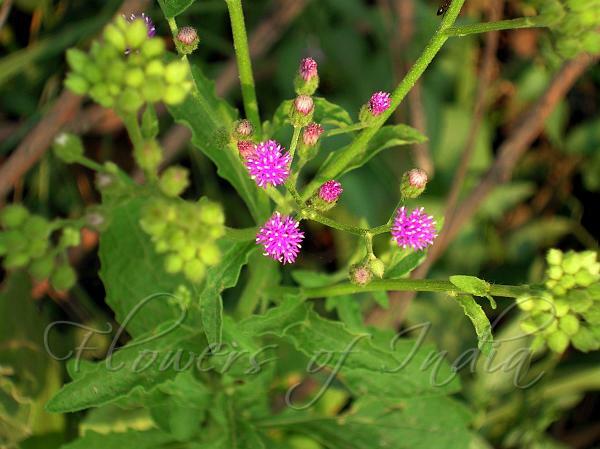 Originally from Central America, now a pantropical weed, it is sometimes considered native to Western Australia. Found in upland crop areas, waste places and roadsides throughout India. Medicinal uses: The seeds yield a fatty oil and are used as an anthelmintic and alexipharmic; they are said to be quite effective against roundworms and threadworms. They are also given for coughs, flatulence, intestinal colic and dysuria and for leucoderma, psoriasis and other chronic skin-diseases. The seeds are made into a paste with lime juice and used for destroying pediculi. Photographed in Lodhi Garden Delhi.